I have a question regarding the GPUs and how their temperatures impact renders. I have a dual 1080 ti FE system and the temperatures stick around 83C-84C. I am in the process of debating getting water cooler systems for each of them, but wanted to get some clarification. it is to my understanding that if a GPU is reaching its thermal boundary with a high load that their performance is impacted- in the case of gaming we may see FPS reduction, but how does it effect renders and their speeds? And would water cooling the GPUs make any improvements aside from fan noise? I honestly had higher hopes for my system to render out a 1920x1080 still frame much faster, but it’s still taking about an hour or more for iRay with UltraHD lighting. Anyone experience stronger results? The only way to get fast renderings with iray is to use the denoiser in 4.11 and the scene optimizer addon. Or you can denoise with Photoshop and optimize the scene yourself by hand. There's no other way. As for GPU temperature you may get about a 10% increase in speed by overclocking. This is what water cooling is for. But I wouldn't advise it specially if you let the GPU working overnight. I would rather advise the contrary. That is, underclock the GPU so to get a 10% decrese in speed with a lower working temperature. This way the GPU is safe to work for long overnight renderings. Of course a water cooling system is always good whatever you decide to do. First off, those temps are way too high even given the load of rendering. You need to address that issue quite apart from worrying about how long it takes to complete a render. Either your cooling solutions on your cards are inadequate, or your air circulation within your case is inadequate. Water cooling may solve your problems, assuming that you get a good water cooling solution. But you need to get those temperatures under control. As for performance, overheating will affect the cards' performance regardless of what you are using them for. It is not thermal throttling in the same sense that a CPU will use thermal throttling, however. With a CPU if a certain threshhold temperature is reached, the CPU will downclock itself until the temperatures reach an acceptable level, even to the point of shutting down altogether to avoid damage.. With a GPU, however, it is not the base frequency of the GPU that is affected. Instead, since Nvidia GPUs use boost clock speeds (essentially overclocking) which kicks in whenever the load on the GPUs increases, it is those boost clock rates that are reduced in the event of overheating. As the frequency drops down to the base clock, performance is lost that otherwise might be available if temperatures are more effectively controlled. So, hypothetically if you can get those high temperatures under control with a better cooling solution, you should get better performance. Just don't expect miracles. An hour is not that long to complete a full scene at high settings, IMO. Most folks who have been doing this stuff for awhile can tell you about letting renders run overnight or even for days. With your two 1080 Ti's you probably aren't going to have to deal with that sort of thing. Unless you are going to stick to very simple scenes, render times measured in minutes are not in the cards.. So, hypothetically if you can get those high temperatures under control with a better cooling solution, you should get better performance. Just don't expect miracles. First are you running MSI Afterburner or GPU-Z? Do those products show that the cards are thermal throttling? If the cards are not boosting properly then you do have a problem. If not then going to water would be too extreme a reaction. Things I'd do if the cards aren't throttling is make sure the case is clear of dust and see about getting a lot more airflow into the system. I will warn you, a full on custom water loop for a pair of 1080ti's is a massive project, you're going to be fully disassembling the cards to start with, and in the end you're going to have a situation where you'll have added a lot of additional points of failure. I'm not saying not to do it just that you should really know what you're doing and be prepared for it before you do. I have to contradict some of what has been said above me. 83 to 84 degrees is not way too high. At least, it is not damaging your GPU. A quick google search will show you that 84 degrees is the factory thermal throttling temperature for your GPU. If that was too high for the GPU, Nvidia would have set the thermal throttling threshold a lot lower. But what that does tell you, is that your render speed is being impacted by your temperature, because it is sitting on its thermal throttling threshold. So yes, sorting out some better cooling, through whichever method, will increase your render performance. @SixDs "First off, those temps are way too high even given the load of rendering." Not true. Those are the design Operating Temps for most of the Nvidia cards. They are the standard setpoints for the fan cooling curve in the drivers,. The driver will not throttle the GPU clock rate unless temperatures exceed those values. Water cooling should keep your cards from throttling, keep your fan noise down, and also- if you need to- allow you to leave your system run without consistent monitoring. However, just make sure you know what you're doing when it comes to water cooling. I have heard plenty of horror stories of people cooling their GPU, but their VRM temps ended up frying the unit. And as Joseft stated, NVIDIA made the 1080 ti Founders Edition's thermal throttling temp at 84C. I have personally have done extensive research into these cards and knew these cards in particular ran hot, but wasn't sure if water cooling was necessary. I have water cooled cards in the past, so I have the experience with that, but I am relatively new to 3D and Video Editing that I wasn't sure how a thermal throttles impacted performance. My only real concern with these particular cards (largest and most expensive cards I've owned) is, if I go a budget route for cooling, how to make sure I am also ensuring the VRM is continuing to be cooled. This was a system I assembled with a few years worth of spare water cooling parts. If memory serves, it was a Haswell i5 and a GTX 780 6GB. I used this system as an auxilliary rendering machine and I believe that the screen shot below was during a test render. This was taken when the Delta temp. seemed to have leveled off (water cooling enthusiasts will understand that point). So, yeah, watercooling is worth it. I still do it to all of my machines, and have for 20 plus years. My current multicard setups would absolutely be in the same situation as the original poster without the virtues of water cooling. Beware, the cost can rival your current system. My primary machines have easily eclipsed $750 each in water cooling gear and they aren't show pieces by any stretch. You can lower those temps. I have a GTX 1080 and an RTX 2080 and I use software like MSI Afterbuner (I have Zotac cards so I use Firestorm) to create my own fan profiles that kick the fans up to 100% after the cards reach a certain temp, in my case I start at 50C. My FE cards run at 60C to 70C (depending on ambient temps, the hotter the day the hotter they run). My video cards are the blower design, so they help a lot to remove hot air from the case keeping the other components like CPU and memory a lot cooler. I also do use a custom built spot cooler to cool my CPU memory. When your GPU hits a certain temp, it will throttle the clockspeed a bit to cool down. The Pascal series has a defined curve for this by design, the warmer it gets the more it throttles. So in that sense, yes, reducing temps can help render times, assuming your GPU is in fact throttling during render. However, the amount of time you would save is pretty marginal, and might not even notice much of a difference. Still, running cool is always a good goal, for health of your PC. 84C is totally fine and well within spec. In fact 84 is pretty standard temp for a FE 1080ti at load. But it is a fact that Pascal throttles well below this temp. 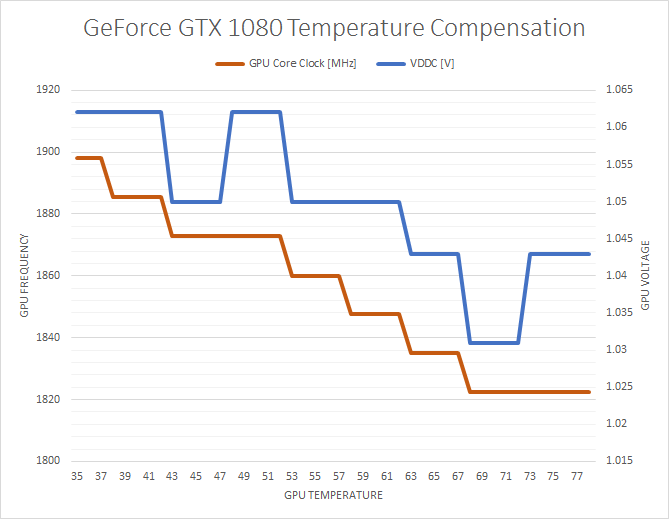 Here is a chart for the 1080 made by anandtech covering the relationship between clocks, voltage, and temps. The 1080ti will behave very similar. As you can see, the 1080 actually starts throttling very early, just above idle temps. Again, this is all by design. I would never suggest overclocking for Iray, or doing crazy mods to any GPUs used for it. Iray is pretty stressful on hardware, and overclocking can introduce problems. I Personally, I do not think it is worth it. A good factory overclock should be good enough, as the card is built and designed for that clock. And you have a FE card, these cards have less than stellar cooling with single fan blowers. Attempting to overclock will only lead to even higher temps. The cooler you keep your card, the higher nVidia's internal algorithm will allow it to boost. I have a 1080 in use now that boosts to 2100 MHz at 100% GPU utilization while only getting into the mid 30's C. This is during a render and a watercooled card. The card in this example is an EVGA SC2 model (08G-P4-6583-KR) that is advertised to boost to 1847 MHz. Yeah, the cooler the better.